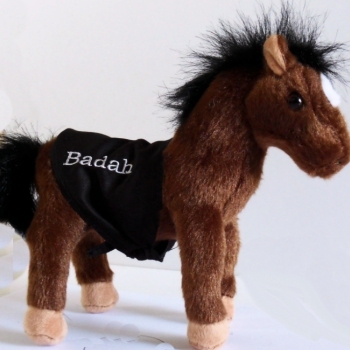 Cute and cuddly brown pony measuring 18cm length ways from head to tail. Classic brown plush fur with light hooves and ears with black mane and tail, white patch on face. Cute and cuddly brown pony measuring 18cm length ways from head to tail. Classic brown plush fur with light hooves and ears with black mane and tail, white patch on face. Comes wearing a black cotton cloth saddle tied around waist that is custom embroidered with a name or initials in a thread colour of your choice. Personalised Cotton Saddle: We can embroider a single name or initials or a numerical birth date (ex. 3.10.12) in a lettering style of your choice.